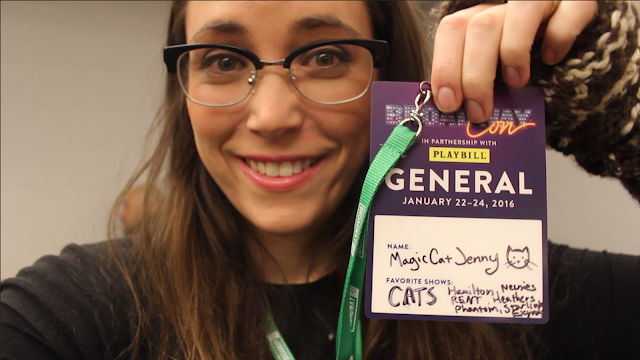 I recently attended the first ever BroadwayCon and I filmed some videos about it for you! BroadwayCon is the ultimate experience for fans of musicals and plays on Broadway. It’s the stage door to end stage doors, where fans come together to sing in the hallways, cosplay as their favorite characters, meet and get autographs from their favorite broadway stars, and make friends with other theater geeks. Performers, fans, and creators (Lin-Manuel Miranda and Anthony Rapp anyone?) from some awesome on- and off-Broadway shows gather in the New York Hilton Midtown hotel to celebrate together. If you love Hamilton or RENT or even CATS (yeah that’d be me), it’s where you belong.